UF Health is riding the crest of a national trend of bringing leading-edge health care services closer to the community by opening three specialty practices at The Oaks Mall in Gainesville. UF Health The Oaks will feature ophthalmology (vision), otolaryngology (ear, nose and throat) and audiology (hearing) services provided by UF faculty in the 139,000-square-foot former Sears space. The facility will also have an outpatient surgical center to support ophthalmology and otolaryngology procedures. The mall is particularly attractive and exciting for several reasons. UF Health ophthalmology and otolaryngology services are relocating from the nearby UF Health Hampton Oaks and another site. Remodeling is expected to take about a year after Sears leaves the site later this year. The long-term lease agreement also includes 500 parking spaces adjacent to the facility. Placing medical facilities in the mall will provide an exceptional experience that is unique in the Gainesville area. It has ample parking and easy accessibility for both local and out-of-town residents. Dining and shopping opportunities abound, giving relatives and caregivers many things to do while they wait for patients undergoing treatment. For patients, the new location keeps accomplished, dedicated physicians and innovative medicine close to home. Physicians in UF Health’s otolaryngology practice have been recognized for expertise in all areas of their specialty, including hearing, balance, nasal, sinus, allergy and facial disorders in both adults and children. The new practice will bring under one roof all practitioners for the cochlear implant program, which uses a “bionic ear” to restore hearing. Its radiology and lab services will provide a “one-stop” destination for ear, nose and throat care delivery. Also, UF Health otolaryngologists are working with the university’s research-focused Center for Smell and Taste on the UF Health Smell Disorders Program. This rare, new model pairs clinical care for smell disorders with the benefits of extensive research to better understand and develop treatments for these often vexing conditions. UF Health has the only ophthalmology practice in the region that covers every subspecialty, including corneal transplants, pediatric ophthalmology, specialty contact lenses, refractive surgery and low-vision services. It also has state-of-the-art surgical and diagnostic equipment. Additionally, it is the only practice in the region to perform novel procedures such as “bionic eye” retinal implants, artificial corneas and miniature telescopes to improve vision loss caused by macular degeneration. UF ophthalmology has a world-renowned Vision Research Center, where the recently approved Luxturna gene therapy for childhood blindness was developed. 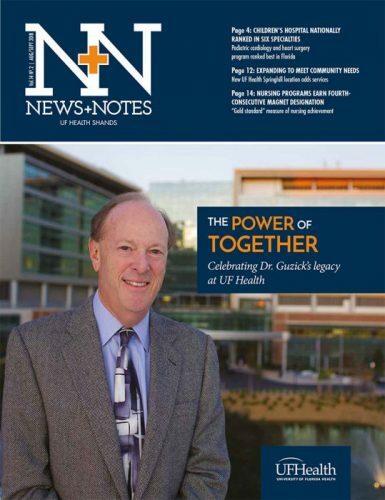 The debut of UF Health The Oaks will also bring changes to other UF Health facilities. The eye practices at the UF Health Medical Plaza and at Hampton Oaks will be consolidated at the new Oaks Mall location, freeing up Medical Plaza space for other services. The move also allows the practices to expand and grow, raising the prospects for future job growth. Nearly 70 employees in the UF Health ophthalmology and ear, nose and throat practices will move to the new location.